Or... what we make them do for us! 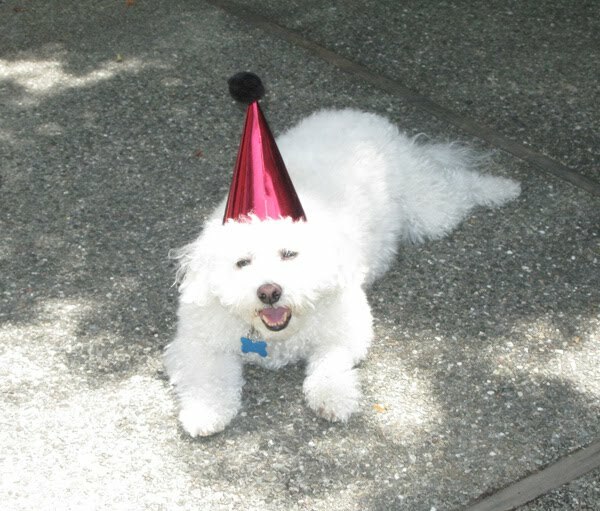 Yesterday was my dog Vito's 10th birthday. 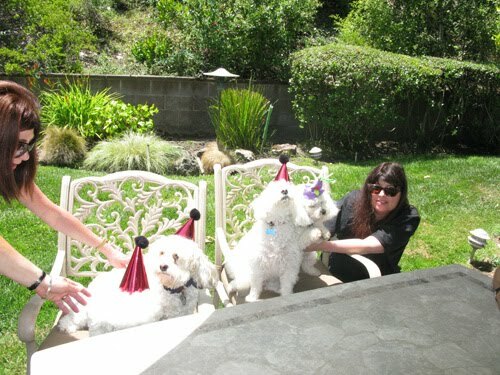 Getting into the spirit, I decided to have a party with doggies and adults. 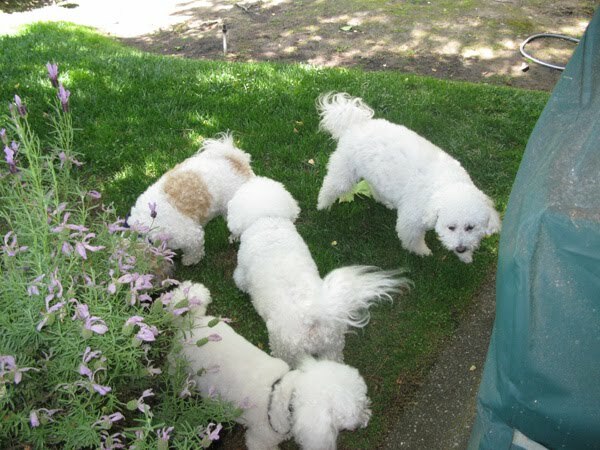 For some reason Vito loves Bichons and Havenese, so his close friends were there to celebrate. My friend Lisa generously donated her house for the festivities! 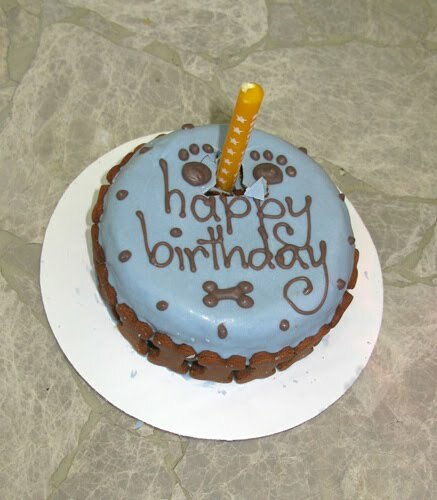 $27 (yes, $27) for an organic dog birthday cake from a dog bakery. Hope they enjoyed it! "Oh, please take these silly hats off of us!" 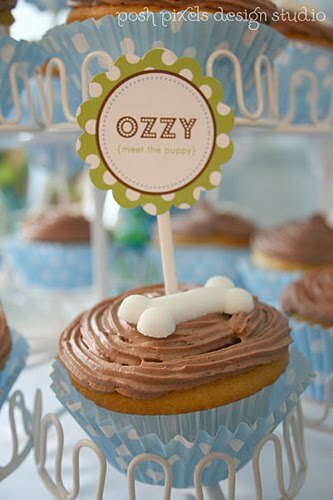 Speaking of dog parties...I had to share this cute "dessert party" that Kristy of Posh Pixels Design Studio created for her new adopted puppy, Ozzy. The theme was “Meet the Puppy,” to introduce Ozzy to her family & friends. There was "doggy" food and "people" food. 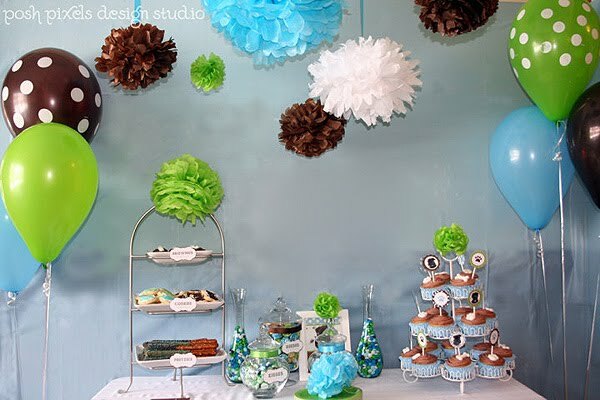 Love that party! So talented! Are we silly? Yes. 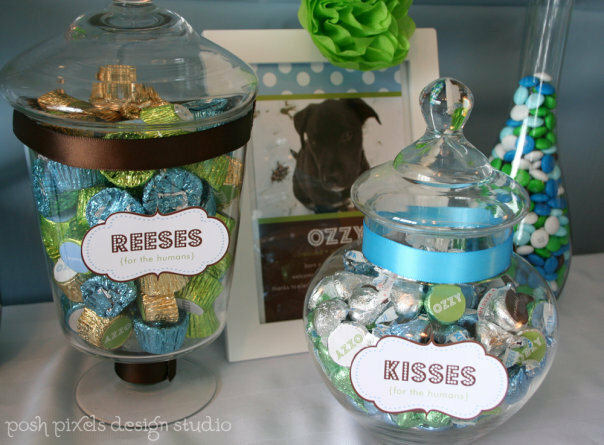 We love our animals so why not spoil them? They give us so much joy and unconditional love! Oh - what HAVEN'T I done is a better question! 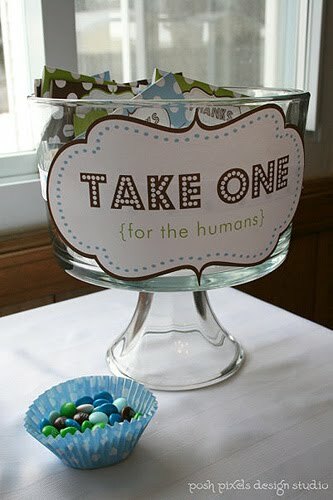 : ) Love the party - I would do it in a minute! Oh What fun for the birthday dog. What a beautiful party, Lynn. Happy birthday Vito from me & Zeke! 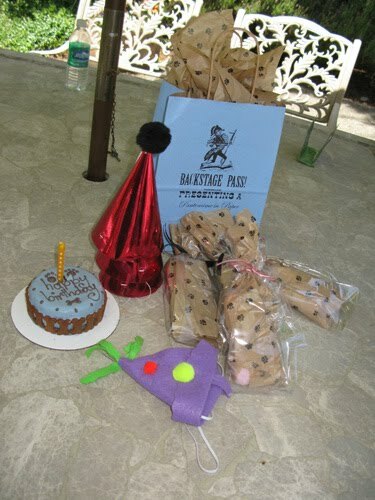 That is SO cute that you had a party for Vito's 10th year! He is adorable and reminds me of my sweet Mimi who is in heaven now. I now have Georgie who is a little darling but not very social. 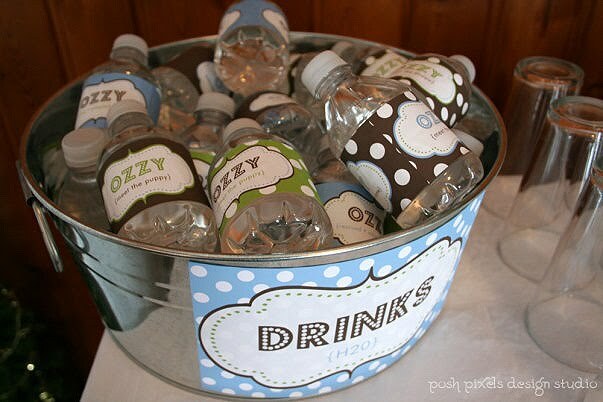 He has just a few BFF's that I could invite so I will consider this idea! I LOVE Havanese dogs. Was there one at the party? I did not see one. Tell Vito he does not look a day over 8! Wow this party is amazing, lucky dogs!!!! Lynn, Vito is the happiest boy in the whole world! You are such a good mommy and Eeeee looks so happy that it is his birthday!! hahaha. that looks like it was fun. Ha! And Alfie thought he had it bad! He is so mad he missed out on those playmates and organic cake! 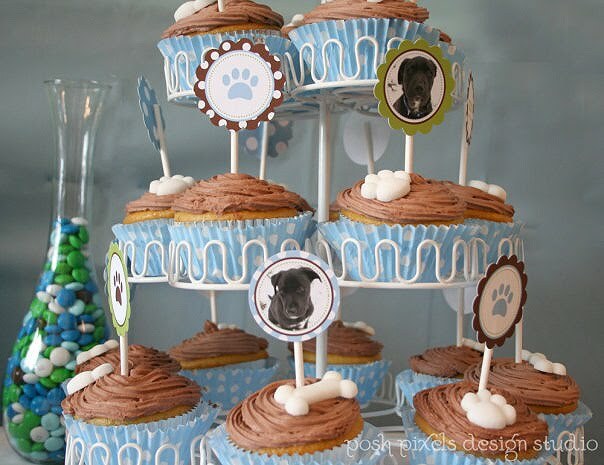 Those cupcakes look good enough for people to eat! 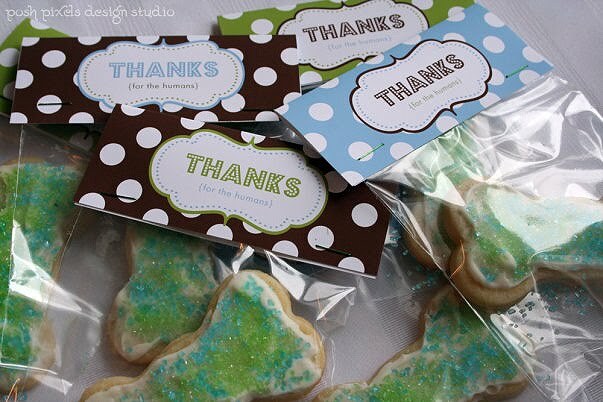 I can't believe you baked and frosted all those and all those decorations are so CUTE! Uh Uh UH!!! 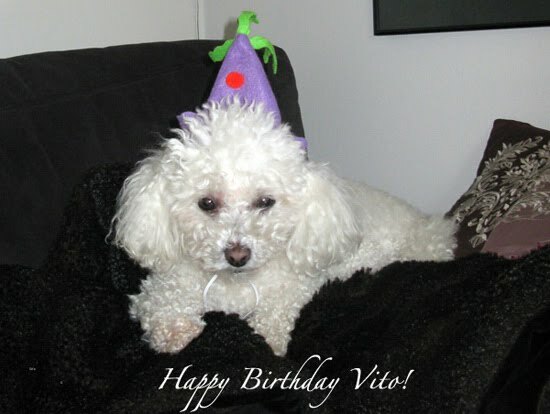 Happy Birthday to Vito! He's so cute, as are all the other dogs. I have 2 bichons myself. They will be 10 in a few months. Thanks for the smile of my day! 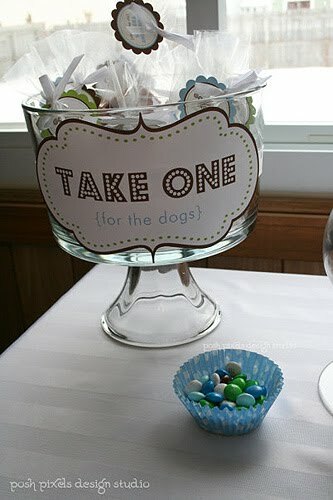 yes we all go over the top for our pets. but nothing like that- wow=tres chic! I'm a total dog lover, and we shower our little pug with lots of love daily, but of course, we go all out on her Valentine's Birthday! Vito looks so happy and loved! What a fun party! 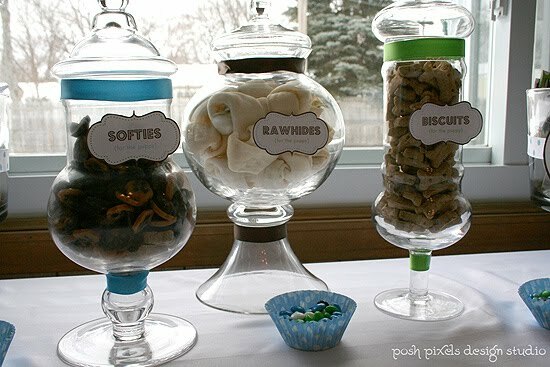 The Pickled Hutch Grand Reopening Party! I Love Old Hotel Stuff! This Happens to Me All the Time...You Too?